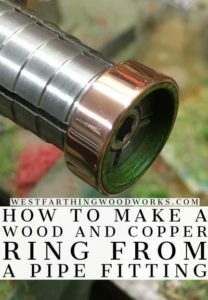 This is how to make a wood and copper ring from a copper pipe fitting. This fun woodworking project combines wood and metal, with the metal on the outside and the wood on the inside. There are complete instructions, tips, and fun ideas throughout the post that will help you complete the project. Enjoy. 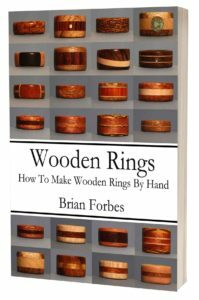 Wood and metal rings are some of the strongest you can make. The beauty of the wood resides next to the strength of the metal. Together, they create the perfect union of function and fashion. This ring combines the look of copper metal with the beauty of green Teekri wood. The metal is on the outside of the ring, and the wood is on the inside. For the tutorial, a lathe is used, though you can do it by hand if you are patient. 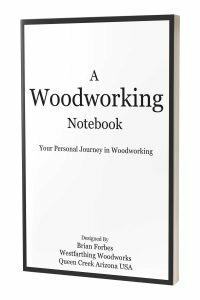 You can use any type of wood and metal that you have in your shop, or you can buy something special for the project. 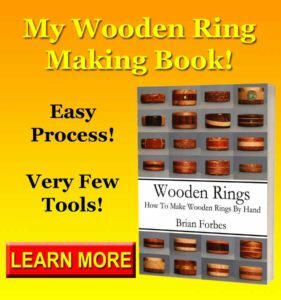 The steps are easy, and you can create wood and metal rings from any combination of materials following these same directions in the tutorial. Some good choices for wood are Ebony Wood, Koa Wood, or Rosewood. Your metal band can also be something else like a silver ring, or titanium ring. Just make sure it’s flat on the inside and outside. A copper Slip Coupling. This is a copper tube a little bigger than 3/4 inch in diameter. You can find these in nearly any hardware store, and they should be about a dollar or two depending on the manufacturer and the price of copper. A piece of wood at least 1/4 inch thick, and at least a few inches by a few inches. This will be your wooden liner, and you can get several from a piece this size. 5 Minute 2-part Epoxy. Get a good brand that you have heard of before. Hack saw for cutting through the metal pipe. Wood saw for shaping the wooden blank. A lathe is ideal, but you can use the ring mandrel in an electric drill too. The process will be a little more involved, but you can still get good results. 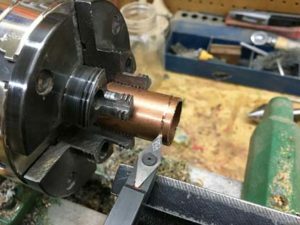 An expanding ring mandrel and a lathe chuck. Forstner bits for drilling the finger openings. Lathe tools or files and sanding tools. 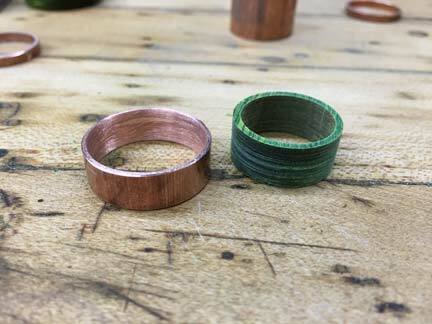 The first step in the copper and wood ring is to get everything together. There are a lot of different types of pipe fittings, so you should know what to look for. These are slip fittings, which are meant to be used to join two longer lengths of copper pipe into one. They come in several sizes, and these are all 3/4 inch. This is a perfect size. It’s large enough that you can accommodate most finger sizes, but it’s also not so large that it would feel too big to wear. Make sure that you look for a fitting that is a little on the thick side. There are really thin fittings available and these are no good. The wall thickness should be about 1/16 inch or larger on the fitting you buy. Also, 3/4 inch means the pipe size, not the fitting size. The fitting is meant to work with 3/4 inch inside diameter copper pipe. That means the fitting is bigger. Don’t measure them in the store. Buy it by the 3/4 name on the price tag. After you have your pipe in the shop, it’s time to cut some blanks. This is an easy process, and you can use several different tools. 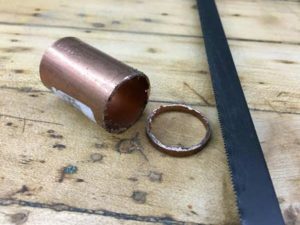 The most common way to cut out your copper ring inserts is with a hack saw. These are special metal cutting saws that you can find in nearly any hardware store. If you do plan on cutting your pipe by hand, mask off a section and then use the tape as a cutting guide. It’s easy to get off track with your saw. The tape will help you stay on target. 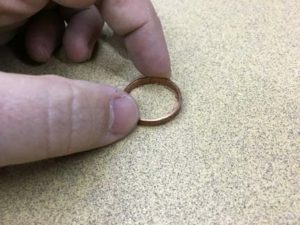 For this ring, cut off a piece of copper pipe about 1/4 inch wide, up to 1/2 inch. The thickness is a personal choice, but for the example ring I did 3/8 inch. 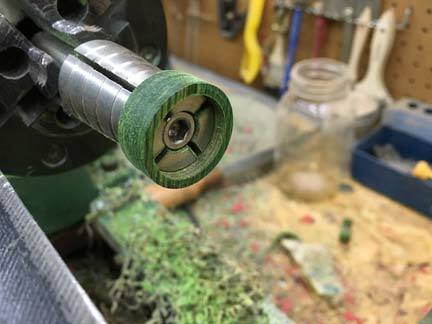 If you are using your lathe for this project, you can use a parting tool to make your ring inserts instead of cutting them by hand. Chuck your brass pipe fitting, and then use a cone shaped live center to center the pipe. Then, tighten the jaws on the chuck. With your parting tool, or a carbide lathe tool, score the copper. Work slowly and carefully, and allow the tool to enter the pipe wall. Get close to the inside and then stop. If you dig too deep, you can catch your tool and ruin your blank. Instead of letting that happen, switch to a hack saw for the last 20% and finish the cut. 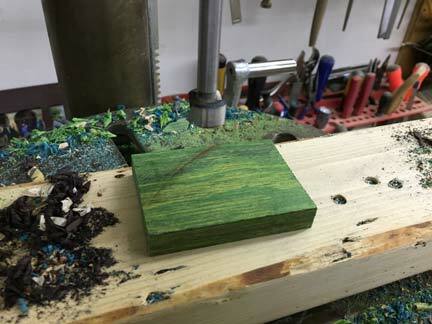 Once you cut your ring blanks, the edges need to be flattened. The sawing process is not a very clean process, and it will leave a lot of rough areas. The easiest way to get rid of these rough spots and flatten the ring faces is to use sandpaper on a flat surface. In this case, I have a granite plate with 220 grit sandpaper laying face up. Hold the ring insert carefully against the sandpaper, and work it slowly. The goal is to flatten the edges without altering the uniform shape of the copper ring. If you press to hard on one side, it will thin that side more than the other. Instead, press evenly, and work carefully. Do both sides. When you can see fresh copper on both edges, you are done flattening. After you flatten the faces, there will be little sharp bits of metal clinging to the inside called burrs. These need to go, and it’s an easy process. You can see a few of these on the inside of my ring blank. All you need to do to get rid of them is to use some sandpaper carefully by hand to knock them off. Sand the inside of the copper ring, and they will start falling off. Break the sharp corner between the inside of the ring and the edges, and in that slight rounding all of the burrs will come loose. Be careful doing this by hand, so that you don’t cut yourself through the sandpaper. These little bits of metal are very sharp, and they cut quickly. Work the entire piece until all the burrs are gone, and then move to the next step. 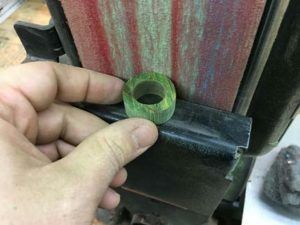 Since this is a wood and metal ring with the wood on the inside, you need to drill your finger opening to the same size as the ring you are making. This just means that if you are making a size ten, then use that bit. If you need to make the hole bigger after the first drilling, do that right away as it might be harder to do later. The best tool for this job is a drill press, and the best drill bit is a Forstner bit. These bits leave clean holes, bore really well, and don’t chip out as much. They are great for wooden ring making because the finger opening needs less sanding compared to twist bits. Make sure that your ring blank is at least the same thickness as the copper ring. It can be a little thicker, and that’s ok too. Drill a hole for the finger opening, and make sure you don’t have any blow out. If you do, drill again until you have a good piece. If you put a piece of wood under your ring making wood it will reduce the blowout on the back end as the drill exits. Now that you have the hole drilled, use a saw to remove as much of the excess around the piece as possible. Make sure to leave enough to turn round, and don’t take so much that the wood isn’t big enough to fill the copper band. Press the blank against the belt sander and continue to refine and round the surface. The goal of this process is to make the turning process easier. Removing hard corners and large lumps on the ring blank makes it easier to turn the piece round. There is less banging, and your blank will stay in one piece longer. Measure the wall thickness of your ring blank and make some markings to ensure that you don’t go too far through the wood. The more you can remove at this stage, the better, just make sure not to go past your marks and you will be fine. The lathe will work really well at removing material as well, so when you are comfortable, you can switch. In this case, I brought the wall thickness down to a little over 1/4 inch. This is enough to get a good rounding on the lathe, and still have some meat left to turn it down to where it fits into the copper insert. 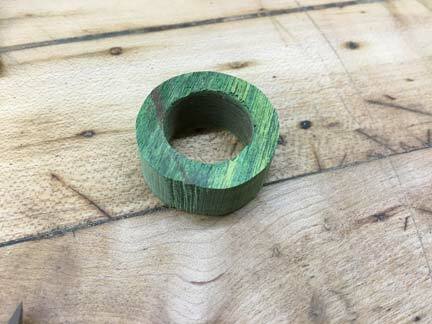 The easiest way to turn your wooden ring blank into a ring is with an expanding ring mandrel. There are a few companies that sell these, and they are great. If you don’t have this same mandrel, you can use what you have. As long as you can grab the ring from the inside, you can complete the steps in the tutorial. 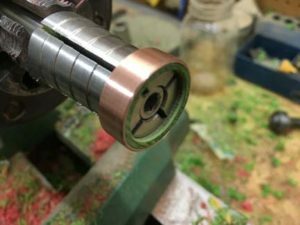 Chuck the mandrel in your lathe, and center it with your live center. Then, tighten the chuck jaws and your mandrel will be secure. Place your ring on the mandrel, and then tighten the bolt to expand and secure the ring blank. Now that you have the blank on the lathe, you need to turn it round. Carefully turn the wooden shape until it is nice and round, and you will notice immediately that the turning process becomes a lot easier. Now that you are round, start removing material from the outside and reducing the diameter. 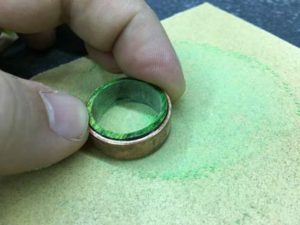 Make sure to measure the inside of the copper ring that you are using, and don’t go beyond that thickness. Work carefully, and work slowly. It’s better to remove a little material at a time than to try and knock out a ton at once. Once you are close, it’s time to bring out the dial caliper. If you do not have a dial caliper, a regular caliper will work too. 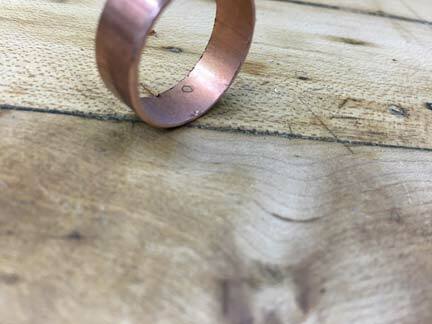 Keep on removing material from the outside of the wooden ring blank until you are close enough to try fitting the copper ring. Make sure to go slowly, and sneak up on the final size. You don’t want to over shoot the diameter, otherwise it will look like a bad fit. Also, you don’t want a really tight fit either, because it will push out all the epoxy. You will know you are done when you can slip the ring on and off easily, and there are not any gaps between the pieces. You should be able to get a couple pieces of paper in there, but that’s about it. When you epoxy two things together, the surface needs a little attention in order to get the best bond. Metal in particular is very smooth. This can cause problems for adhesives, because they cannot bite as well onto the surface. In contrast, a rough surface is easier for the glue to grab, and the bond will be a lot stronger. If you use a little 100 grit or 80 grit sandpaper, you can create some scratches on the surfaces and improve the bond. 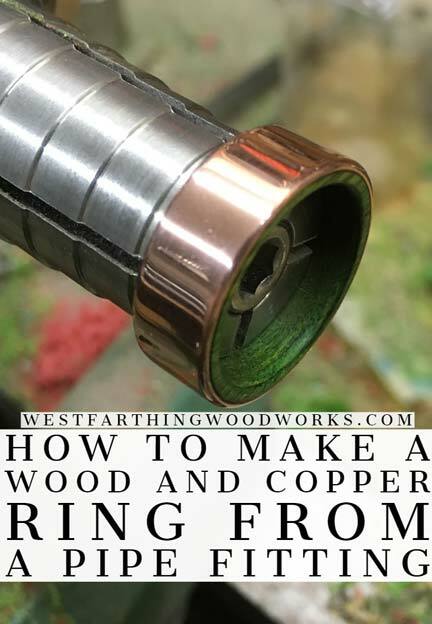 Simply rub the inside of the copper ring with the sandpaper. After that, do the outside of the wooden insert carefully. Now, you have a lot of small scratches, and these are perfect places for the epoxy to grab, and improve the bond. Two part epoxy is one of the best adhesives that you can ever use. The bond is incredible, and it can attach nearly anything to nearly anything else. There are some things to know before using the product that can help. 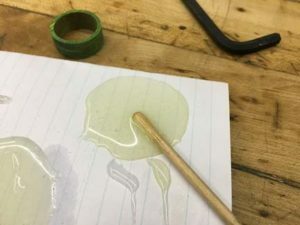 They will make you a better woodworker, and they will make your experience with two-part epoxy a lot better as a beginner. Squeeze or pour out an even amount of both the resin and hardener. It’s called two part epoxy, because the two parts react and harden. Keep your two parts even. Use a toothpick or small wooden dowel to mix the epoxy. Mix for several seconds, until the pile is completely combined. If there is a color difference in the liquids, it will look even when you are done. You really only have about 4-5 minutes to apply the adhesive. Make sure to have all of your pieces ready to go before you mix. It’s a shorter time than you think, so plan on working swiftly, and you won’t have to worry about the epoxy hardening too fast. Now that your epoxy is mixed, it’s time to join the wooden insert and the copper ring. Use your toothpick or small wooden dowel as an applicator, which makes transferring the adhesive really easy. Coat the inside of the copper ring completely, and then the outside of the wooden insert. You don’t need a pile of epoxy on either, you just need to get both surfaces wet. After that, slide the wood into the copper ring, and press them carefully together. Align them well, and wipe off any epoxy that may have squeezed over onto the wood or the top of the copper. Hold the pieces together for a minute or so in order to give the epoxy time to gel. After that, set them down to cure for several hours, or better overnight. Once the epoxy has fully cured, now you need to flatten the faces. Odds are that your piece of wood and your metal band were not exactly the same size. That’s ok, and it’s actually easier to just epoxy them together and then sand them like this. Find a flat surface, like a nice piece of MDF, or in my case, a granite plate. Lay out a piece of 100 grit sandpaper with the grit facing up, and start sanding. Work the ring in circles, and the faces will start to even out. As you go, pay attention to how the shaping comes along. You need to make sure that you are not changing the overall shape of the ring. As you sand, check the ring face often. Once you get to where the copper and wood are the same level, adjust your pressure to areas that are still a little light, and it will focus on them more. 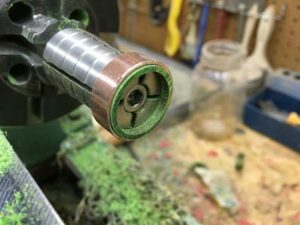 When the entire surface has fresh sanding marks, and the copper ring looks like it has been evenly sanded all the way around, you can switch to the other side and do the same thing. 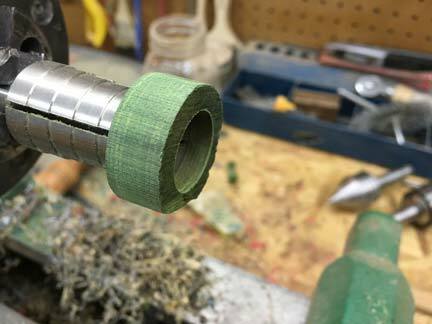 Place the sanded ring on the ring mandrel, and turn on the lathe. You now need to round the corners, and break any sharp edges with sandpaper. Also, if you want to create a comfort fit, you can sand or turn it while the ring is on the mandrel. 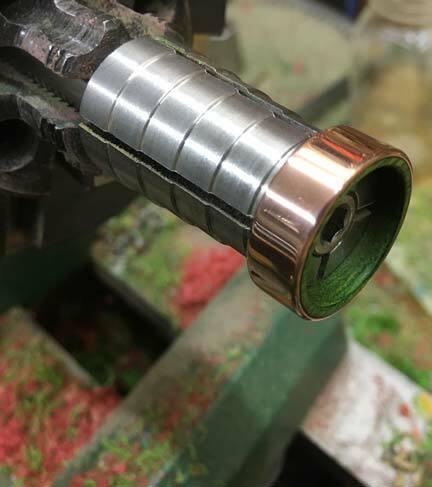 You also can decide at this point if you are doing a brushed finish on the copper part of the ring, or if you are going for a mirror polish. Work through the grits, and when you get to about 220, you can continue through to 0000 steel wool for a shinier finish, or stop at 220 for a more brushed look. Either way you go, make sure to get into the ring and address the edges so that the ring is comfortable to wear. To polish the copper on the lathe, you need some 0000 steel wool. This polishing is better than sandpaper, but not as good as a buffing wheel. 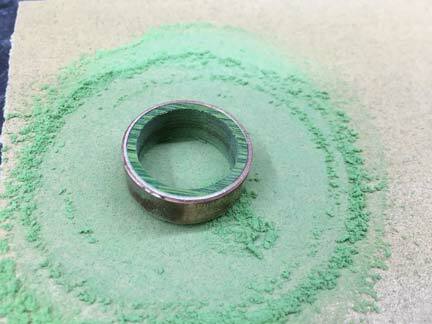 All you do is sand the ring down to 400 grit on the lathe, and then switch to 0000 steel wool. Make sure to not hold the wool against the copper too long. 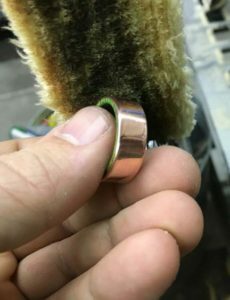 The ring will heat up rapidly when you are using wool, and if you get it very hot, it can cause the epoxy bond to weaken. It does take some high heat to break the bond, but stay well away from that. The ring can last forever if taken care of, just as long as the initial bond is not compromised. Press the wool against the ring, and check it often. It will brighten and shine very quickly, and it’s an easy look to create. If you are going for the ultra polished look, and you really want the ring to shine, you can take one more step passed 0000 steel wool. That’s buffing. A buffing setup is not that expensive, and you can get a really good deal on the Beall Buffing System if you already have a lathe. The system mounts to the lathe, and the motor turns the buffs. This way, you don’t have to buy another motor when you already have one. If you are making a unique wedding band, polish it really well. You can create a first class look with a little buffing. This also makes a great engagement ring. A wood wedding band is a very popular ring choice now, and this combination of wood and metal is a great example. One thing about buffing metal though is that it’s dirty. I actually have two Tripoli wheels for that reason. One is for working on metal, and the other for wood. Metal turns the wheel dark, and the residue prevents the wheel from polishing wood very well in the future. 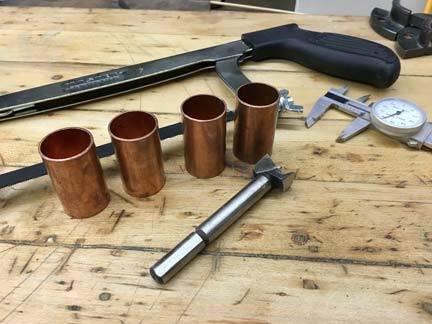 That was how to make a wood and metal ring from a copper pipe fitting. This process can be applied to nearly any other wood and metal combination, and you can make these rings in a lot of different looks. Once you start making rings like this, you will be hooked. 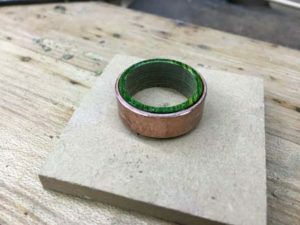 It’s actually not much more involved to use metal inserts in your rings, but you will create a product that appeals to a far wider audience than rings made form wood alone. The metal adds strength, and the wood gives the ring great beauty. Combine them together in your ring designs, and you get the best of both. This is a great relationship, and your rings will look amazing. If you have any questions about the tutorial, or need some help making your ring, please leave a comment and I will be glad to help. Do you not put any coating on the copper side at least? I wondered about the copper tarnishing especially if it gets wet. Thank you Alex. If you don’t want to get any color on your fingers, then you will need to coat the copper with a layer that keeps you away from direct contact with the metal. You are correct, Copper will tarnish over time and it can turn your skin green. You can use a coating like Protecta Clear, or even apply a layer of clear two part epoxy and then sand/buff/polish when it cures. I don’t get a lot of hand sweat going under normal circumstances, so I don’t notice the green issue as much. Thank you again, and happy building. How would it be to put a coating of CA on the copper to protect fingers from getting black.? Thanks Dale. I don’t do a lot of CA finishes myself, but I know they are popular on wooden rings. I imagine it should stick to copper, but I would do a little test to make sure. Happy building.